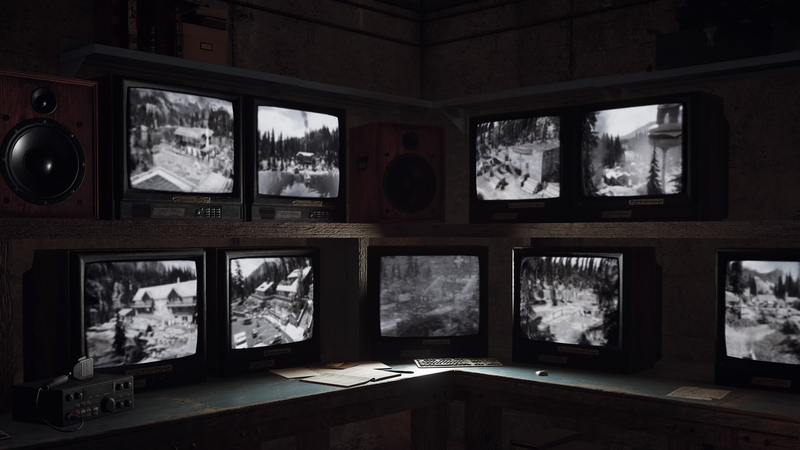 Old TVs and radios are scattered throughout the game, many of which hint at darker stuff bubbling just beneath the game’s surface. Drive around long enough in Far Cry 5 and you might stumble into an area where strange static comes out of your radio. Stop and listen for a bit and you might even be able to make out voices on the other end. It’s weird and creepy, and has a few players wondering if it might be part of something deeper going on in the game’s world. Far Cry 5 is full of radio stations where you can listen to classic rock, cult hymns, or depressing news reports alluding to events taking place outside of the game’s fictional Montana setting. Colby had just left a baseball field in Far Cry 5 and was headed north to look for a possessed wolf when he first heard the weird noises coming out of his car’s radio. This weird static went away the second he drove more than 20 yards in any direction. It almost sounded like a person, or creature, crying out in agony. The ambient noises were creepy on their own. The garbled groans sounded haunting. He tweeted out a video of the experience and posted about it on the game’s subreddit to enlist the help of others in uncovering its source or meaning. “So, like anyone else who uses escapism to fill the sadness they feel in being useless at life, I drove around the grassy hill there to try and see if there was a hidden quest or secret,” Colby said in an email to Kotaku. “I drove in each direction to see where the broadcast stopped, so I could try to triangulate, but still found nothing,” he said. Lots of other players who also found his discovery are trying to help him hunt for clues as to what it might mean, or what locale or quest it might be connected to. So far these efforts have included canvasing the entire Northern section of the game’s map in an assortment of normal and cult-owned vehicles at different points during the story and comparing what they find. Maybe if they could find enough of these spots they’d be able to discern a pattern. This has resulted in a lot of cars wedged between non-destructible trees but also a litany of other spots in Far Cry 5 where this mysterious static can be found inexplicably permeating the airwaves. The center waypoint marker is where Colby first encountered the strange static noise. He later found the radio static near the game’s dam, with a voice occasionally saying the word “emergency” with what sounded like gun fire popping off in the background. He also encountered it near the game’s Whitetail Park Ranger station and FANG animal center, both before and after defeating the game’s main villains. Eventually he concluded in his Reddit thread that the various locations might be triangulating to somewhere along or underneath the Moccasin River that snakes through the center of the map. While plenty of diving expeditions are sure to follow, nobody’s yet found anything in the water there. I visited some of the locations Colby and others have discovered and heard the static as well. The phenomenon is so specific it’s hard to dismiss. One commenter in the thread suggested it might be related to some of the phone messages scattered across the game. “There are a couple black, corded phones. One has a lady begging for help and one with someone just whimpering,” wrote user MRaholan. Another commenter, NFsleeper, speculated the locations of the static might be moving. “After I found the first 3 I found 3 more along the road. After discovering those on the road I could no longer trigger the first 3... Is the circle moving inwards?” they asked, posting this screenshot of their findings. Others are convinced it’s all just ambient noise, procedurally generated to help Far Cry 5’s world feel more alive. After seeing Colby’s video I decided to go to the same spot and see what I found. At first there was nothing. Then as I offroaded my pickup into the nearby hill I heard it. Loud, cycling static masking what sounded like garbled human speech. A newscaster perhaps, or someone putting out a mayday call. The haunting voice on Colby’s video never appeared, but the hyper-localized nature of the static—a football field-sized area off the side of the road in a completely ordinary part of the game’s map made it hard to simply chalk the phenomenon up as simply a random collision of the game’s complicated emergent storytelling systems. This isn’t the first time Colby’s found himself deep down the rabbit hole of seemingly unexplainable video game anomalies. “Remember that hidden mechanism in Battlefield 4 or whatever, where if you do things on the one multiplayer map, it’ll make a building collapse?” he said. “I somehow came across the subreddit when they were trying to figure out what the whole Easter egg was, and spent hours trying to help them by constantly scanning social media and YouTube for any mentions of the phrase they had to go on.” More recently he he spent 10 hours trying to find a cave mentioned on a table in Bayek’s tomb in Assassin’s Creed: Origins. “I get super into lore of games and stuff, to the point I have three pages of notes I’ve written up regarding a theory I have that The Maker in Dragon Age doesn’t actually exist and Andraste’s whole story is actually the Chantry appropriating Elven history,” said Colby. After spending nearly a day looking into Far Cry 5’s static he has some theories there as well. The first is that it really is just a coincidence, a combination of over-eager player imaginations and some top-notch world building on Ubisoft’s part. His other guess is far more interesting, and also somewhat spoilery for any who haven’t already finished the ga“My biggest dream, though, is that the secret is tied to Jacob’s conditioning: the static is from towers that he uses to play Only You when he turns Rook on the Whitetails, and maybe there’s a secret secret ending where we disable the power source for those towers, so when you choose to walk away in the final ending, the song doesn’t broadcast on the radio and we actually escape to Missoula without killing the sheriff.” It sounds so good I hope it’s true also.